Good afternoon ladies and gentlemen. 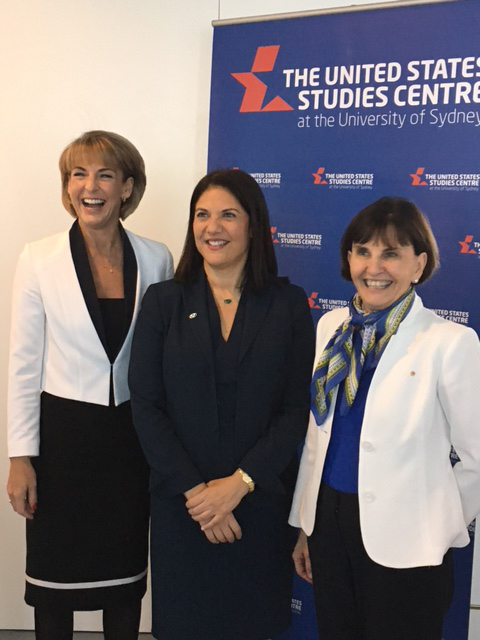 I’m delighted to welcome Mary Ellen Iskenderian, CEO of Women’s World Banking to Australia. Before I begin I’d like to thank W21—the 21st Century Global Women’s Initiative at the United States Studies Centre for supporting Mary Ellen’s visit—it’s terrific to have you here at Parliament House. At last month’s APEC meetings in Manila, the Prime Minister said that ‘the case for increasing women’s economic participation and empowerment is compelling from every perspective. In the Asia-Pacific region alone, it is estimated that up to $US 89 billion is lost every year because of limitations on women’s ability to participate equally in the economy. Here in Australia, if women participated in the workforce at the same rate as men, it would add an extra 13 per cent to our GDP. Financial inclusion is about human development and empowerment; about giving people the means to improve their lives. It is not only the right thing to do, it’s the smart thing to do. At the G20 summit in November last year, all G20 countries agreed to the ‘25 by 25’ goal—reducing the workforce participation gap by 25 per cent by 2025. If achieved, this will bring more than 100 million women into the labour force, significantly increasing global growth and reducing poverty and inequality. But it’s just one piece of the jigsaw. Businesses, non-government enterprise and local communities need to be involved to ensure goodwill translates into real progress. Women’s World Banking is ground-breaking because over the past decade or so it has fundamentally changed the way we see financing in the developing world. It teaches us that we need to stop thinking small scale and instead focus on the big picture. For the one billion women in the world who do not have access to banking, a microcredit loan only goes so far without the safety net of the other financial services we take for granted. H.M Queen Maxima of the Netherlands, UN Secretary-General’s Special Advocate for Inclusive Finance for Development, Annual Report to the Secretary-General, September 2015. If I can borrow your words, Mary Ellen, ‘there is nothing micro about one billion women.’ Through access to savings accounts, insurance, financial education or credit, for the more than 955,000 clients who access Women’s World Banking financial products, long-term financial security has become possible. Banking gives women the tools to start a business, make a living and support their family. It also helps women to save, build a future and make a long-term investment in themselves. It gives women a safety net. Investing in women is also key to eliminating the barriers to economic growth we face at home. For Australia to remain prosperous, we need to use all the levers and measures at our disposal to make our economy more productive. The rate of workforce participation of Australian women is 75 per cent— well behind the rate for men, which sits currently at about 83 per cent. As the Minister for Women and the Minister for Employment, I’m in a unique position to drive change to close the participation gap. Women’s World Banking also plays a key leadership role in research, recently partnering with the Australian Government’s Department of Foreign Affairs and Trade to assess access to financial services for female-owned small to medium enterprises in Southeast Asia. The vast majority of the enterprises in the five countries assessed had either no access or insufficient access to credit. Financial infrastructure is key to tackling the barriers to development we face in our region. But our approach is about more than just investing in women—just like Women’s World Banking, it’s about helping women invest in themselves. In small business, for example. Currently, one-third of Australian small business owners are women, which equates to almost 670,000 businesses. Women between the ages of 25 and 40, are the fastest growing wealth demographic in the country. By reducing regulatory burdens and ensuring our tax system incentivises business, the Government is assisting more enterprising women follow this path, expanding their economic footprint, and securing their financial independence. 2015 has been an important year for progressing gender equality and women’s economic empowerment. The adoption of the United Nations 17 Sustainable Development Goals in September was a turning point. The fifth Sustainable Development Goal aims to “achieve gender equality and empower all women and girls”, we must even look beyond ‘helping them up’. For women to achieve gender equality and play a greater role in strengthening communities, we need to provide them with the tools to— literally—invest in themselves. Once again, Mary Ellen, welcome to Australia and that you for joining us. Thank you.